Creating flat yet intricate cards is desirable, especially when you want to mail your little masterpieces. Today we're going to look at how to achieve superb Inlaid Die Cutting! Today's video will give you a closer look at inlaid die cutting. Stephanie gives you a step-by-step process for how to inlay like a pro. Watch the video below or click here (MFTv - Creating a Die Cut Inlay Background) to watch it on YouTube. Don't forget to subscribe to our YouTube channel so that you don't miss a single tutorial! What a nifty way to play with our vast array of Die-namics, right? The possibilities are endless! Let's take a look at a few examples of some projects that feature inlaid die cutting. Our Centerpieces Die-namics are perfect for inlaying. 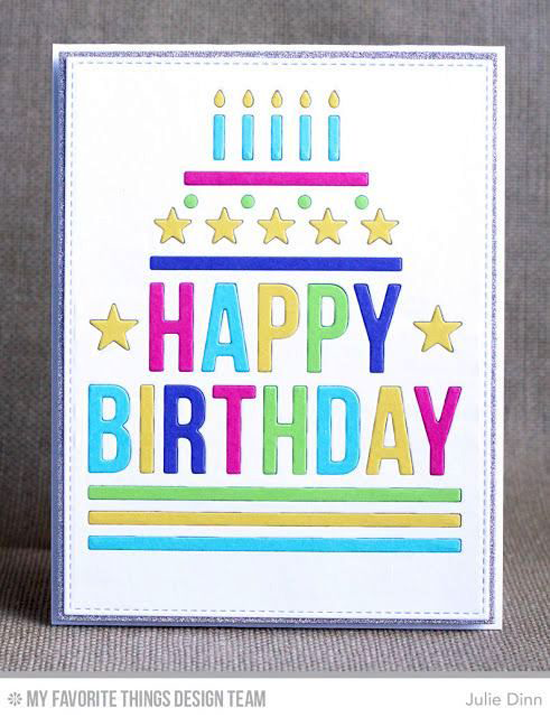 Julie die cut the Happy Birthday Centerpieces Die-namics from a white card stock panel and then die cut it again several times with various colors of card stocks. With this technique, you can choose any color combination your heart desires! Jody went inlay crazy on this design! 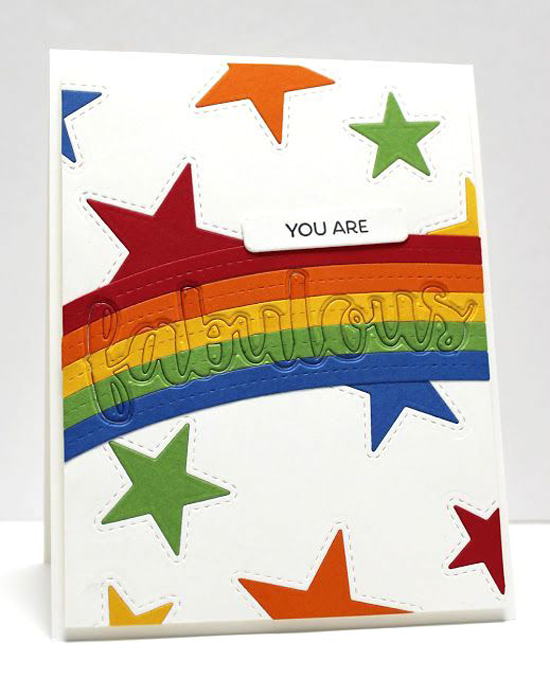 First, she die cut the End of the Rainbow Die-namics in a spectrum of color, and then she die cut the word fabulous from the completed rainbow and layered it into the rainbow. Very fun! 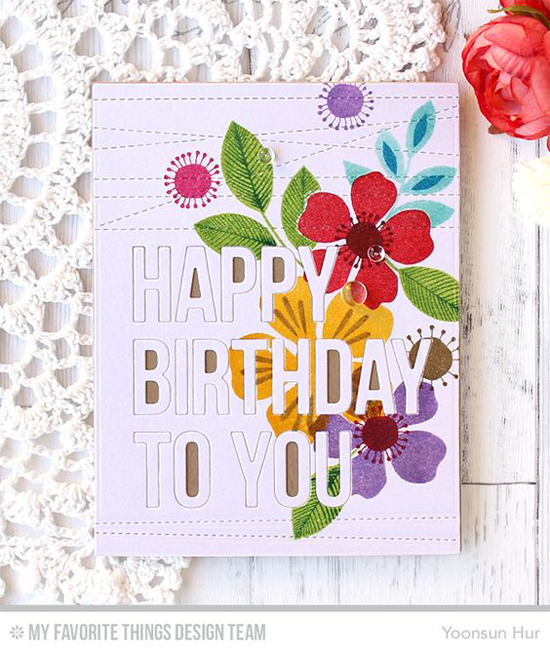 Younsun stamped a gorgeous background with the Flashy Florals stamp set and then inlaid her sentiment using the Happy Birthday to You Die-namics. SO lovely! Leaving the centers of the letters to allow the kraft card stock to peek through is a great way to make inlaid die cutting legible. You will LOVE experimenting with inlaid die cutting. Be sure to tag #mftstamps when you post your projects online. We can't wait to see what you've made! Happy to see flat, yet intricate cards, showcased today! While I like fancy layered cards as much as the next person, I always need flat cards as many of them are mailed. Great ideas. Does this ever happen to you guys? I think I have a birch tree die but I'm not sure...hmmm.The little forest friends stamp set is so cute. Love this sweet one layer card with loads of detail! Enjoyed this video!! Beautiful card!! Love the inlay technique. Thanks for the video on inlaying. I will have to try this technique since your card turned out so cute. Love inlaid die cutting. Love all the card samples. Great video as always, Stephanie. Very cute critter card and the inlaid birch tree background looked awesome.